6.0L PowerStroke FueLab competition only fuel system with a pick-up tube or sump. 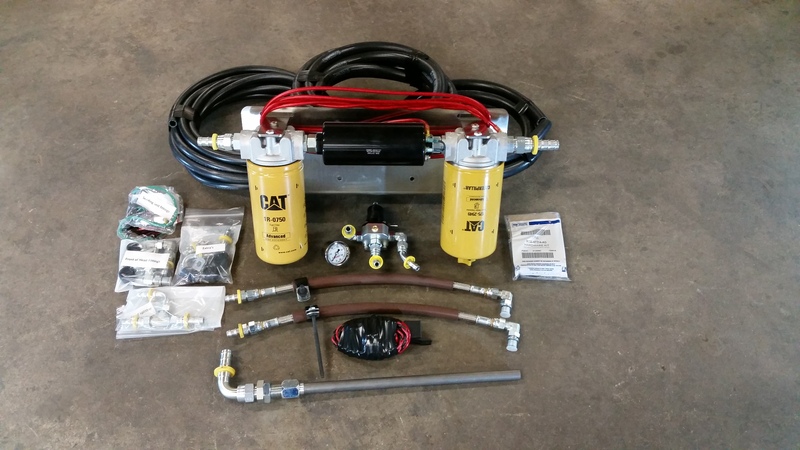 This kit deletes the factory fuel system entirely. It includes a new sump and can return into the sump or the sending unit. This kit includes a complete regulated return. 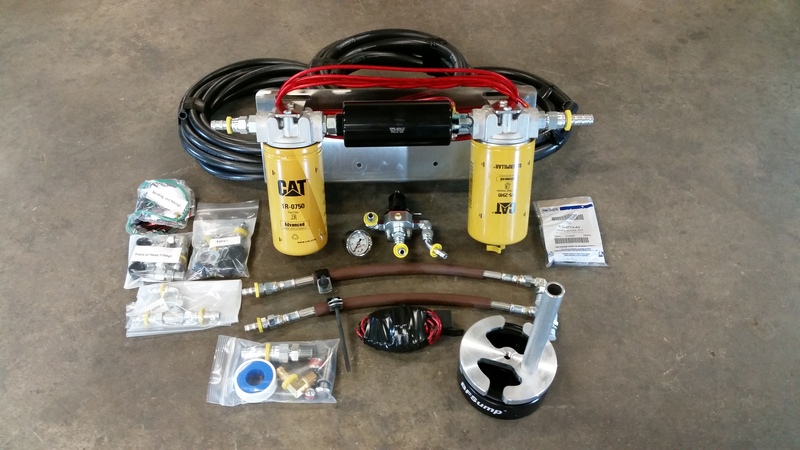 We suggest this setup be used on trucks that are mainly used for competition/show and not as a daily driver. If you need serious fuel for a daily driver and redundant reliability of 2 pumps, we would suggest either of our V2 never stranded kit. Complete parker 801 push-lok hose for feed and return. All kits include enough hose to fit a crew cab long bed pick-up truck. Insulated stainless braided lines to be installed by the up-pipes. Hardware and clamps provided to hold fuel lines in place to keep from rubbing or breaking. Turbo hardware kit that includes stainless hardware for the up-pipes. Regulated return that can be mounted on alternator or where you see fit. Extra fittings, padded p-clamps and hardware to use as needed. Two different length filters. 7.5″ long CAT filters or 5.5″ long Napa filters. Complete wiring harness that only requires 5 electrical connections. Electrical connections included. Our Sump with feed and return or a pick-up tube assembly. Sump requires 3″ hole saw for install. Marty’s Diesel handles the warranty on the bracket, hardware, fittings, etc. Shipping is included in the price of the kit to any of the lower 48 states. Return shipping is customer responsibility. A 15% restocking fee with be deducted from any returned fuel system kit. 2 or 4 wheel drive. Where you plan to mount the kit, inside/outside of the frame rail. Long Cat filters or the shorter Napa filters. If the truck is an F250/F350 or F450/F550. If one individual/shop buys 3 complete fuel systems ($1,000 or more), the 4th and all kits thereafter are reduced in price. Log into youtube with your password we sent you in your instructions.